The essence of this tea is: Renewal. Every day, our body gets exposed to harmful toxins and chemicals coming from the environment and even from the food we eat. When too much of these toxins accumulate in our systems, it can lead to a variety of health issues, such as constant fatigue, unhealthy weight gain, and constipation. Now you can flush out those toxins and enjoy a variety of health benefits with a warm cup of Yogi Tea Detox with Lemon Tea! Yogi Tea Detox with Lemon Tea features a wholesome blend of natural herbs and extracts that will cleanse your system and promote exceptional whole body health at the same time. This warming tea is all about making you feel better, lighter, and healthier by draining out unwanted substances from your body. 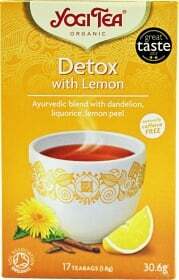 What do you get with Yogi Tea Detox with Lemon Tea? Lemon Grass for improving sleep quality and relieving indigestion! Dandelion for draining out excess body water and providing antioxidant support! Ginger to enhance nutrient absorption! Cinnamon for promoting optimal brain health! Liquorice for fighting stress and elevating your mood! Lemon Myrtle and Lemon Peel for restoring healthy pH levels in your body and cleansing your bowels! Peppermint for supporting excellent digestive health! Yogi Tea Detox with Lemon Tea has a refreshingly tangy taste that you will surely enjoy early in the morning or at night before you head to the bed. Detoxify your whole body and experience more vigor at once... start enjoying a warm cup of Yogi Tea Detox with Lemon Tea! Have a question about Detox with Lemon Tea? What is it, what does it do, how and when to use or something else? Ask us.